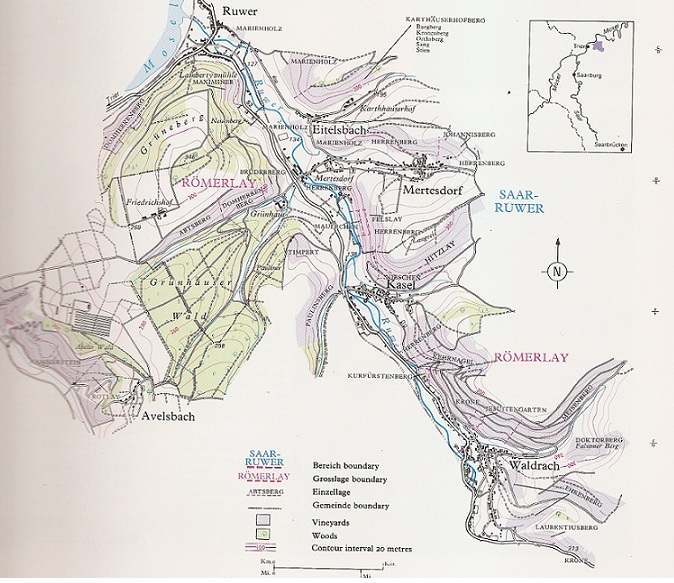 Between 1951 and 1966 the German section of the Mosel river was tamed by ten hydroelectric power plants – we started below the top one. 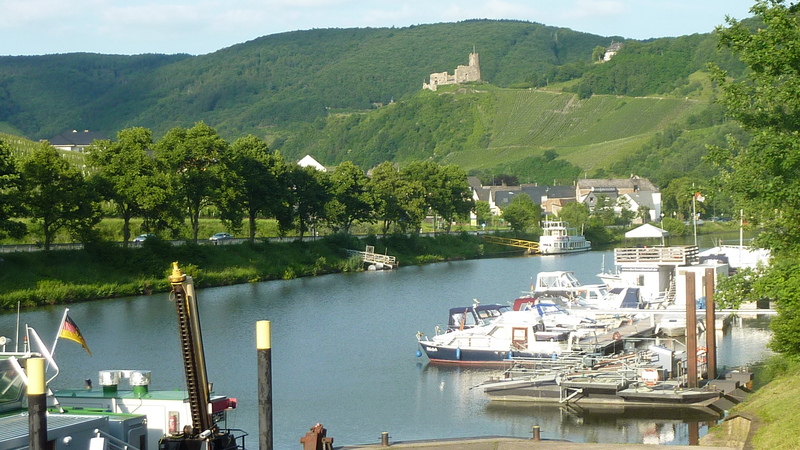 Our trip includes the Middle Mosel, famous for the sweet Reisling wine grown on the steep south-facing slaty slopes. 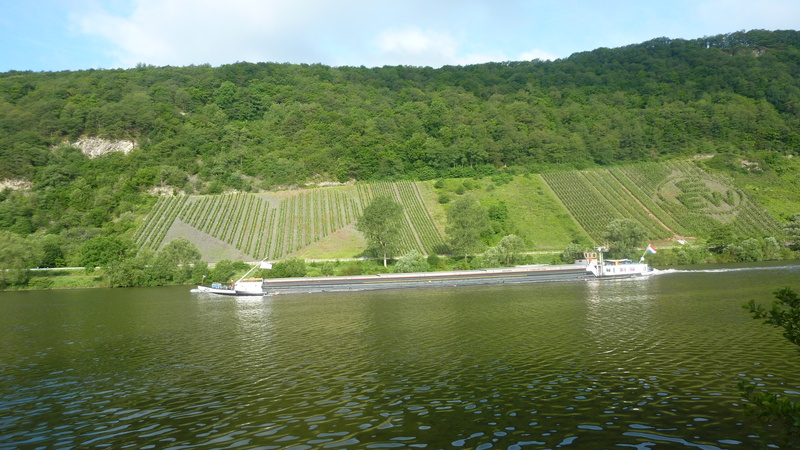 Commercial barges (click here) are the main hazard. 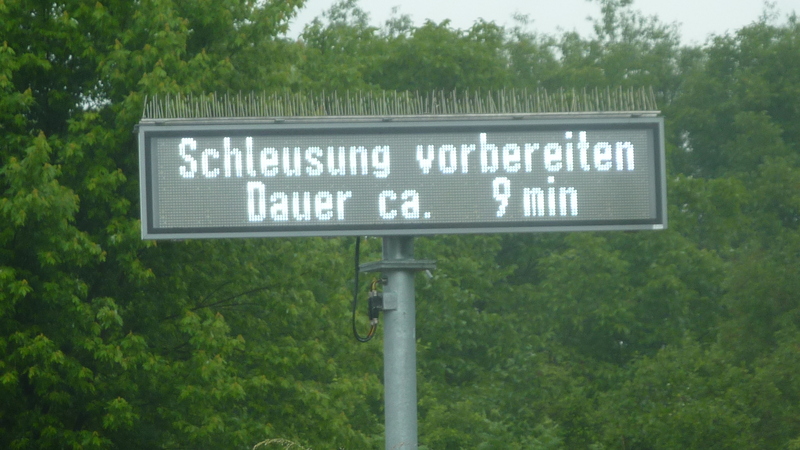 0 km – Trier. 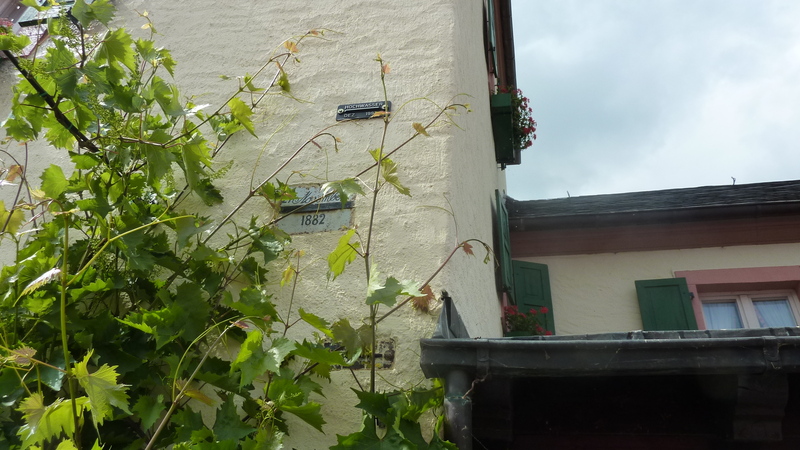 Birthplace of Karl Marx. A wine city since Roman times. 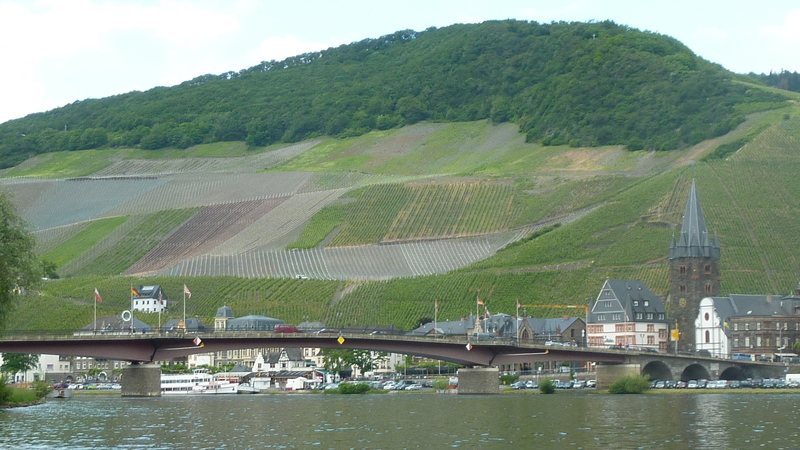 Not much wine grown locally now, but the big Mosel estates have cellars here. 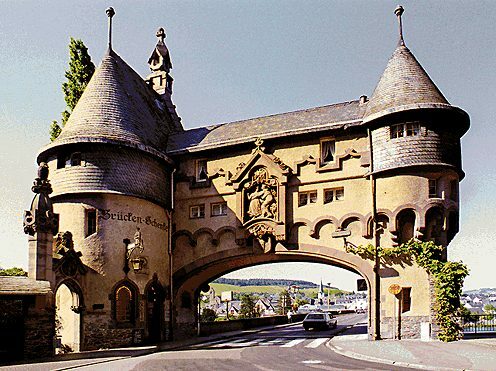 Ignore the bistros on the central squares and try Theo’s by the Porta Nigra. Schales mit Apfelmus turned out to be something like a Spanish Omelette with apple sauce. Delicious. 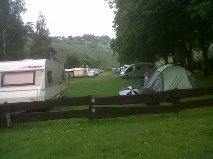 Camping Treviris. Click here. Left bank a few hundred yards above the Roman Bridge. 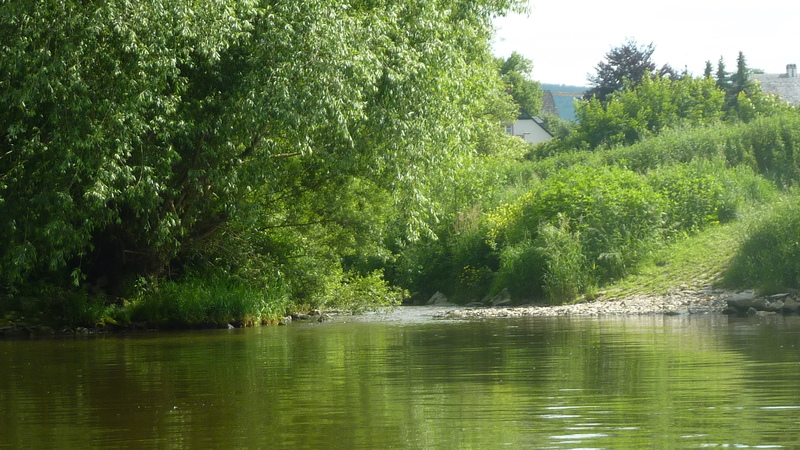 Lovely site, although the brothel 50 yards downstream startles a bit – unexpected in such a small town. 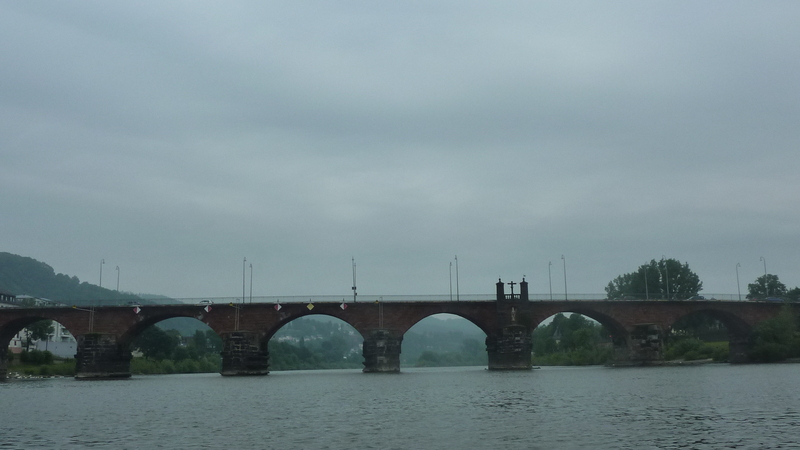 0.5 km – Roman Bridge. 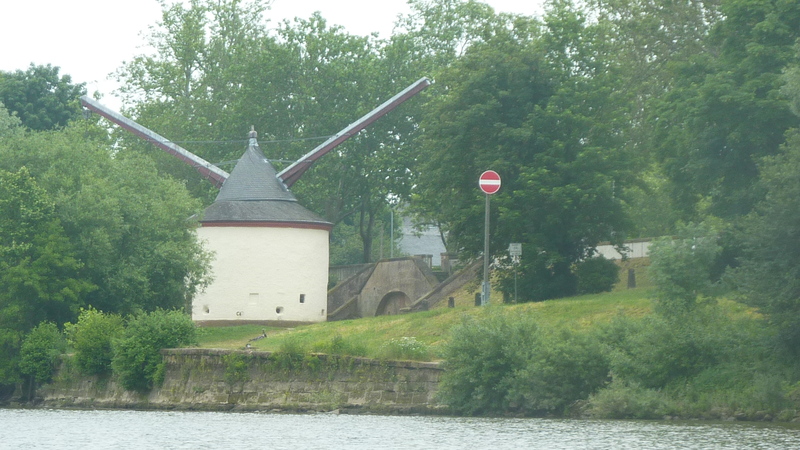 The treadwheel cranes on the right bank date from 1413 and 1774. 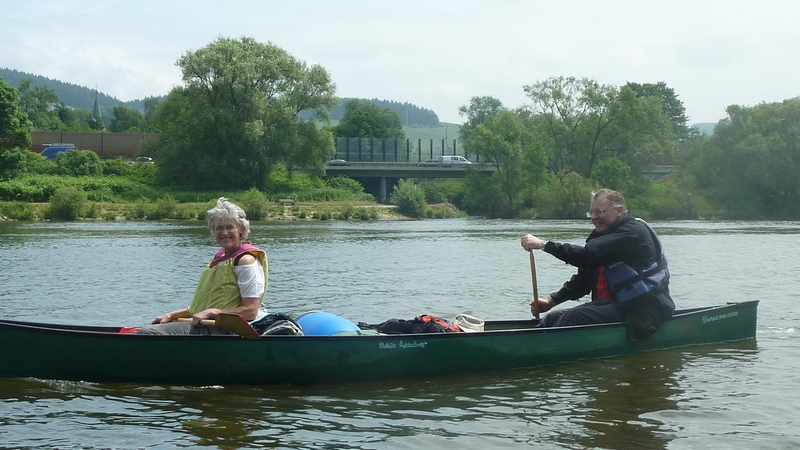 7 km – River Ruwer joins right. 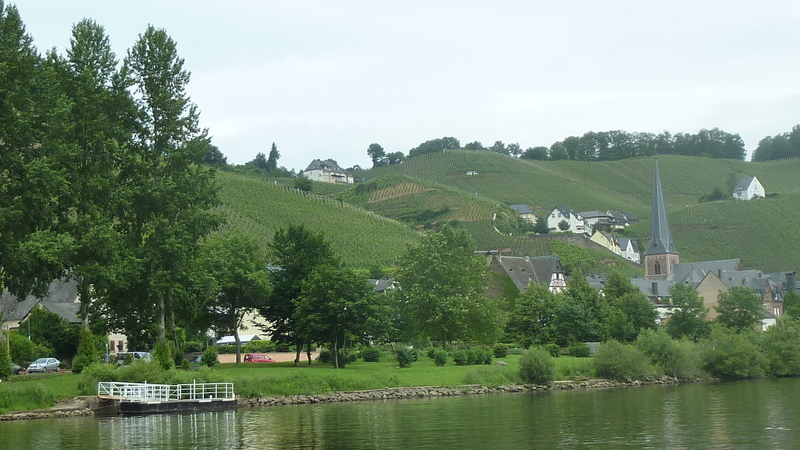 The famous vineyards on this tiny stream are all within a few miles of the mouth, but the 602 traffic makes a landing unenticing. Say goodbye to the sandstone. The bedding planes dip west and you’re paddling over progressively older rock. 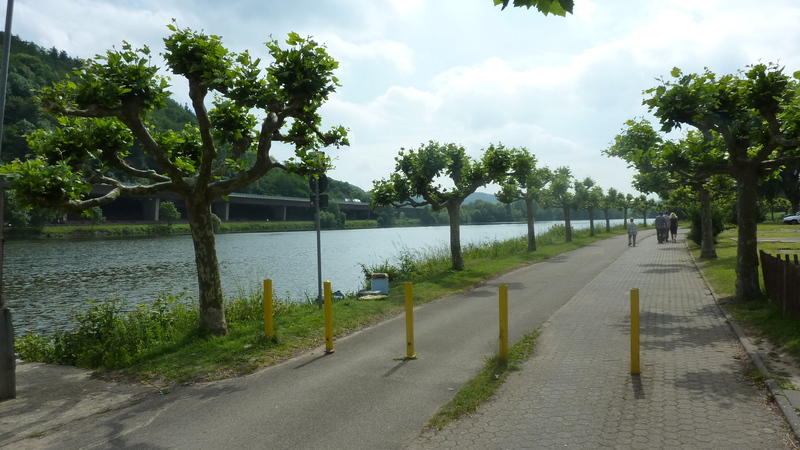 13 km – Schweich. Old ferry toll house, camping, bars, restaurant and marina left (click here). A good lunch spot. 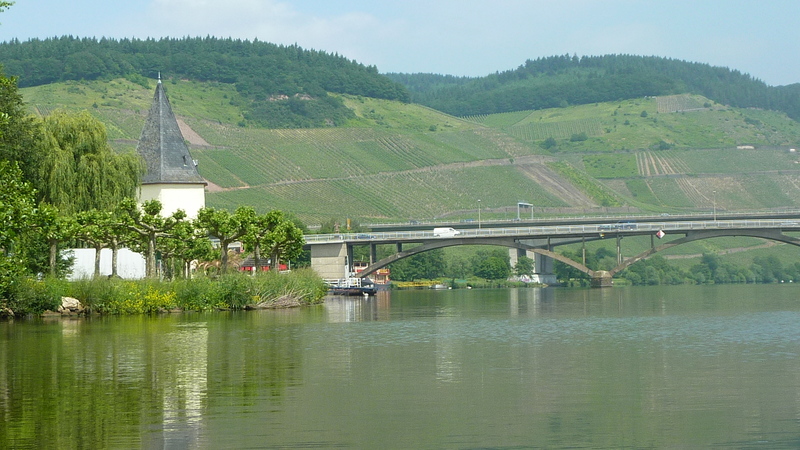 The river starts to cut through the older Devonian Hunsrück Slate, and the first vineyards appear on the hills to the left. Lovely, slightly chaotic site. 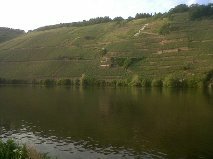 Settle down with your glass of Moselle looking across the river at the first of the really steep vineyards. This is the Blattenberg, the finest in Mehring. 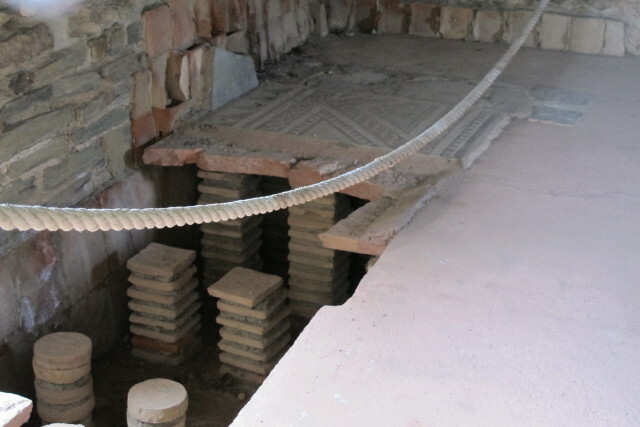 Visit the restored 2nd-4th century Roman villa Rustica a short distance behind the campsite. 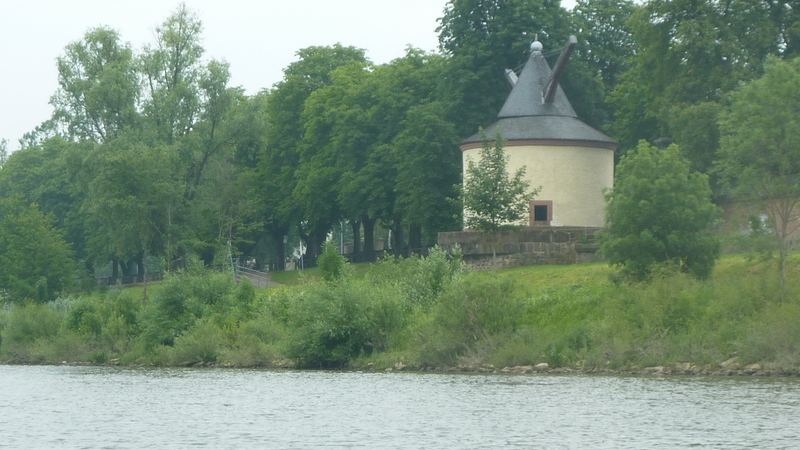 27.5 km – Detzem weir and lock. Schleich left. 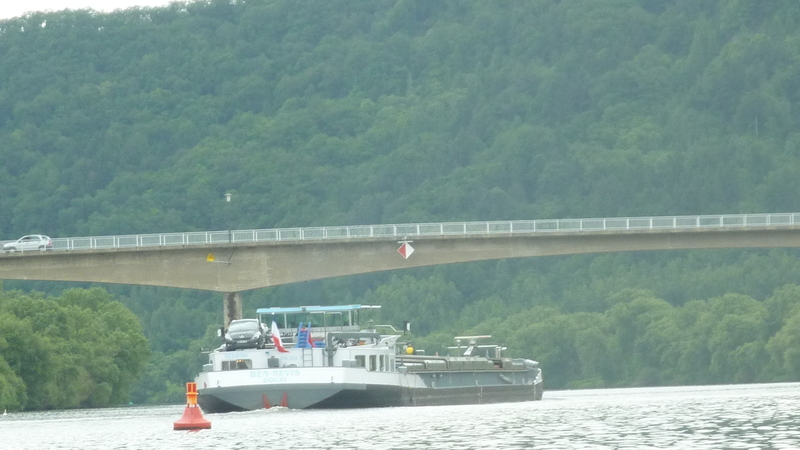 Barges go right of the island, but canoes and small craft should pass left. 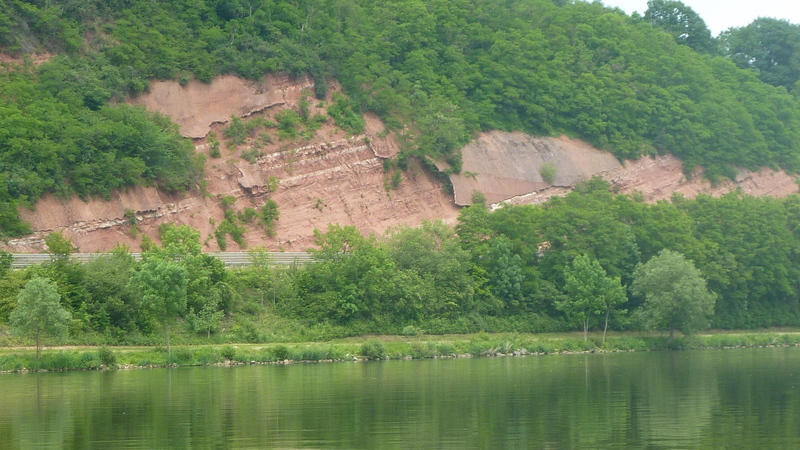 Keep close to the island (right of the weir). 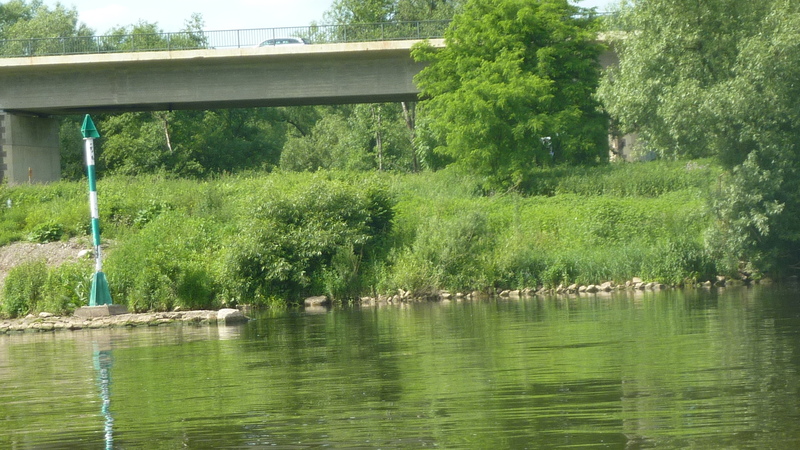 Either a long, fairly easy portage where the canoe shoot should be, or use the small lock. 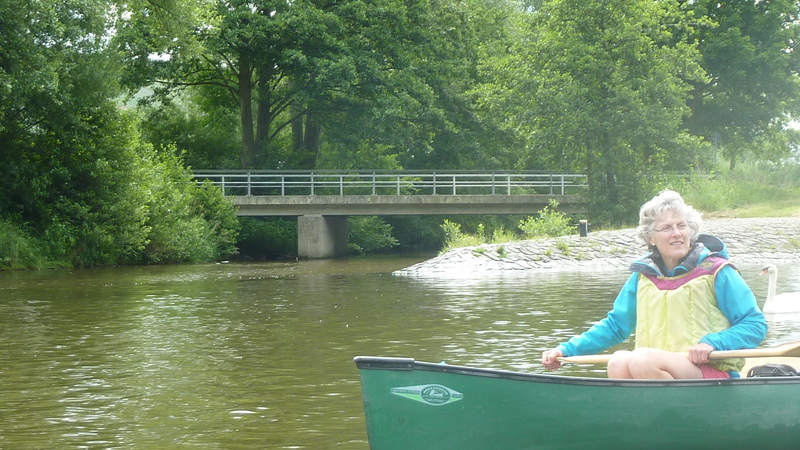 There’s no charge or licence for canoes. Just pull the green handle. 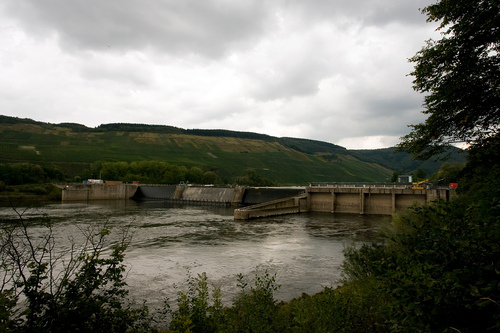 At 9 metres, Detzem is the highest weir on the river, and its 24 MW power station the most powerful. 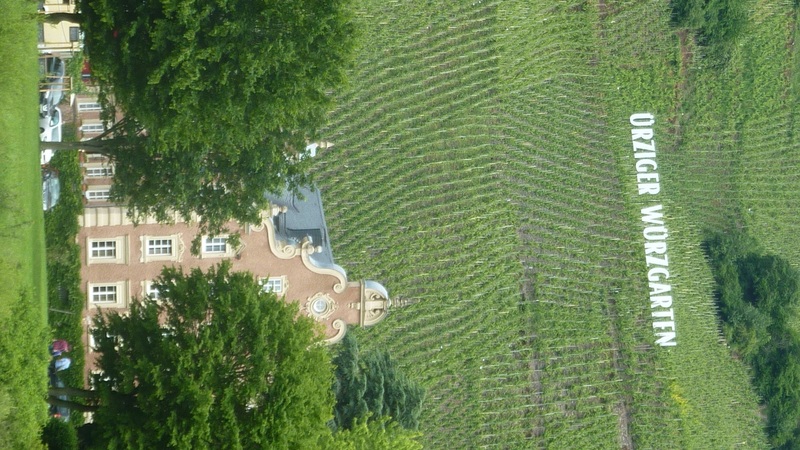 “Ritsch” is the south facing vineyard left. Thornicher Ritsch is good to find on your bottle. 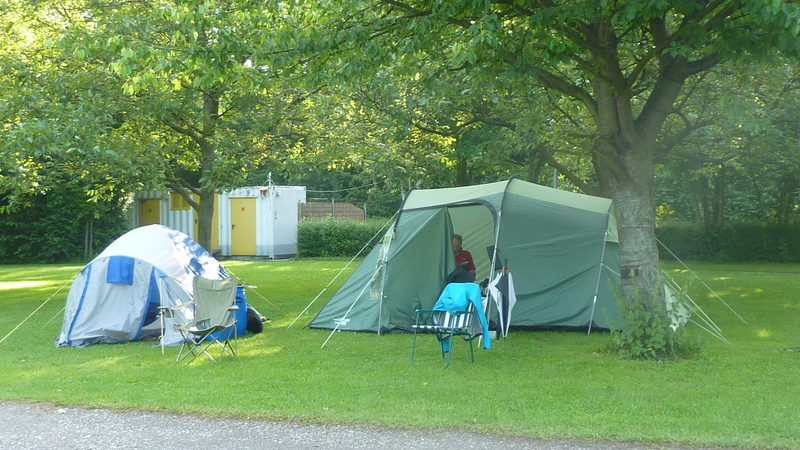 32 km – Camping Klusserath left (click here). A big site in a big village. Klusserath inspired the proverb So lang wie Klüsserath (As long as Klüsserath). The vineyard opposite, Laurentiuslay, makes very fine wine. 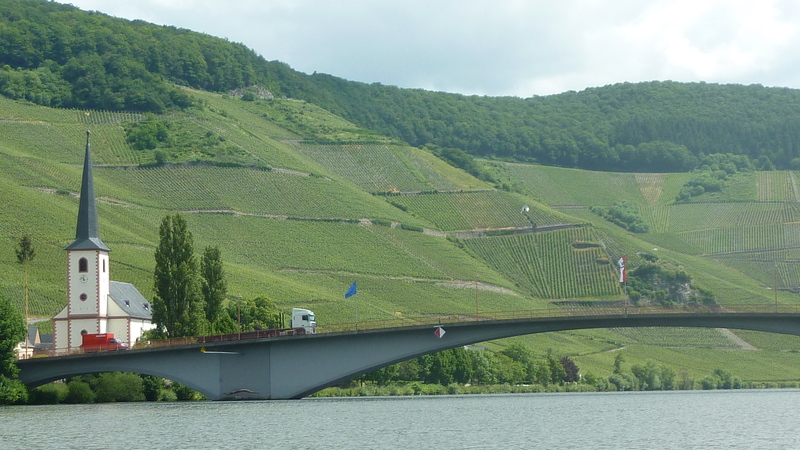 37 km – Trittenheim bridge. Trittenheim left. Ferry towers just downstream. Landing and campsite left just before the bridge. Click here. 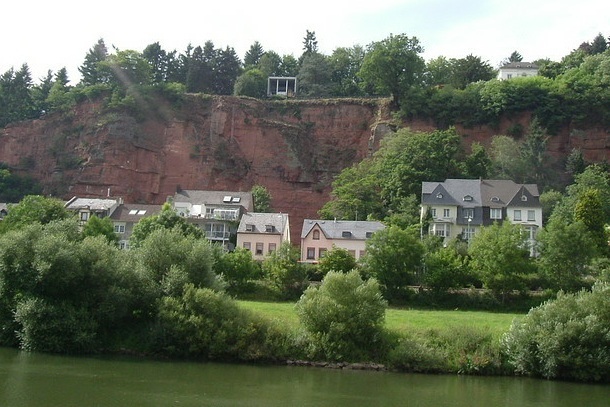 44 km – Neumagen Dhron. Camping right. Click here. 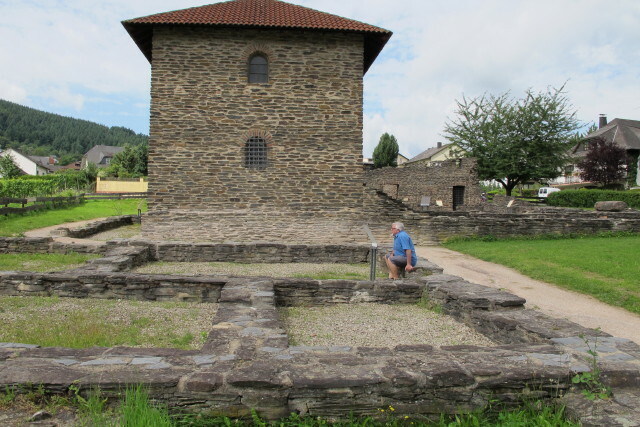 This is claimed to be the oldest winegrowing village on the Mosel on the basis of a Roman wine merchant’s tomb dating from 200AD. 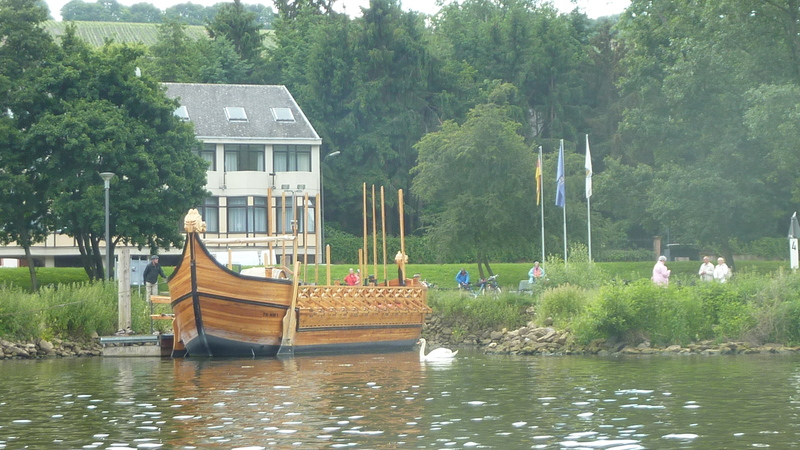 Stella Noviomagi, the Star of Neumagen, a replica Roman wine ship is available for hire but seems to be rarely used. Hardly surprising – the EU paid for it in 2007, and the local council own and run it! 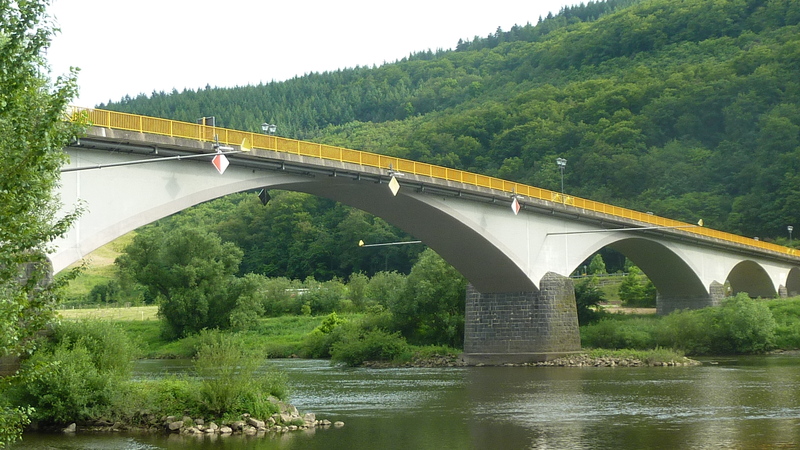 45 km – Neumagen Dhron bridge. 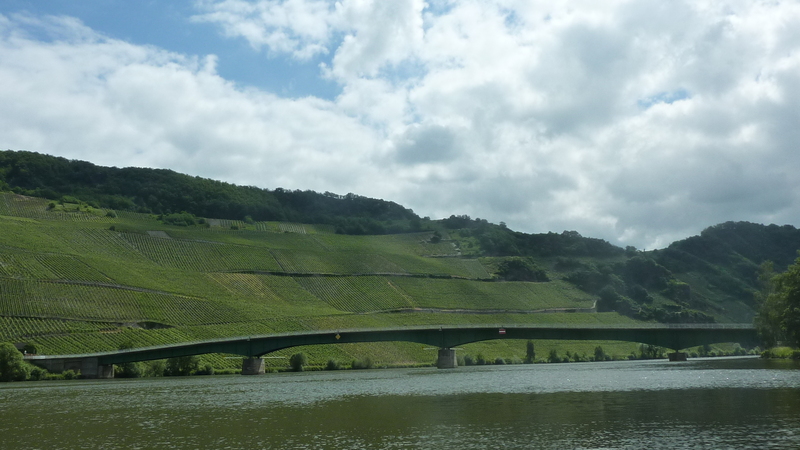 As you pass under it one of the most famous of all Mosel vineyards comes into view – Piesporter Goldtröpfchen. Not to be confused with Piesporter Michelsberg! 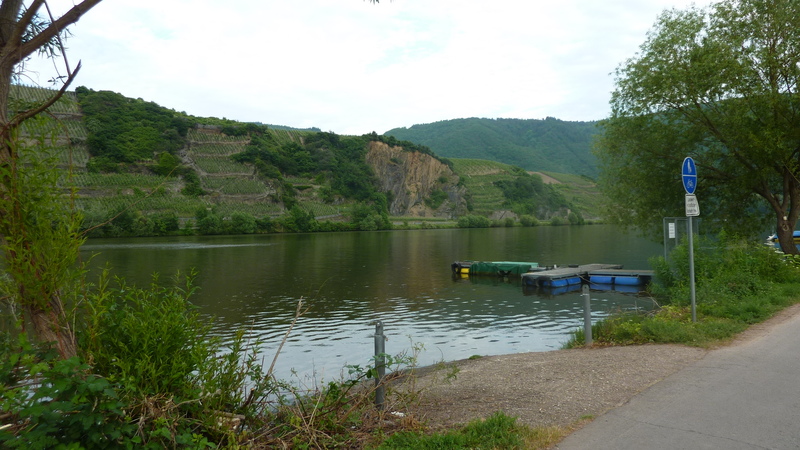 45.5 km – River Dhron enters right. 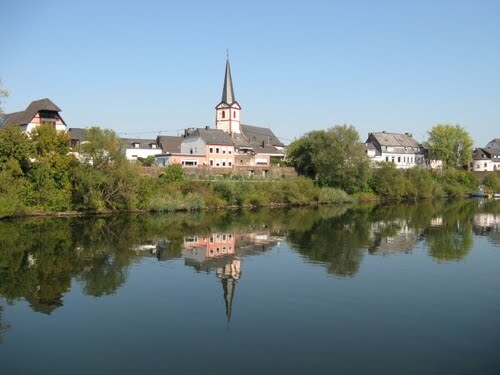 55 km – River Rondelbach joins right. 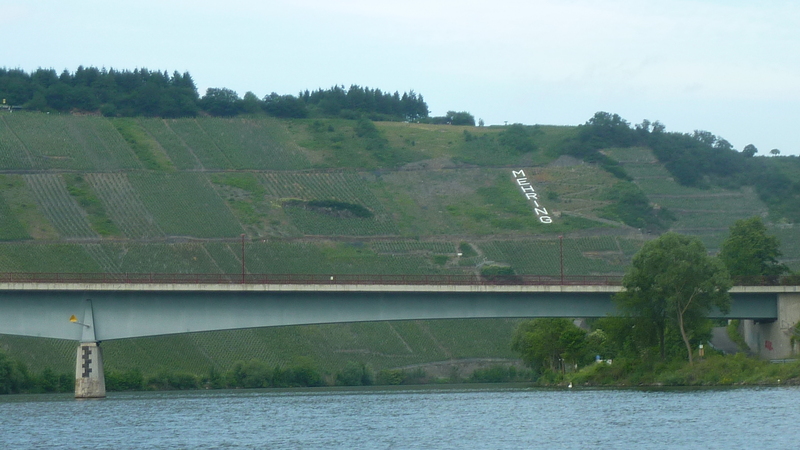 The cross on the hills right marks the Ohligsberg vineyard, the best in Wintrich. The locals put on a Passion Play every five years. 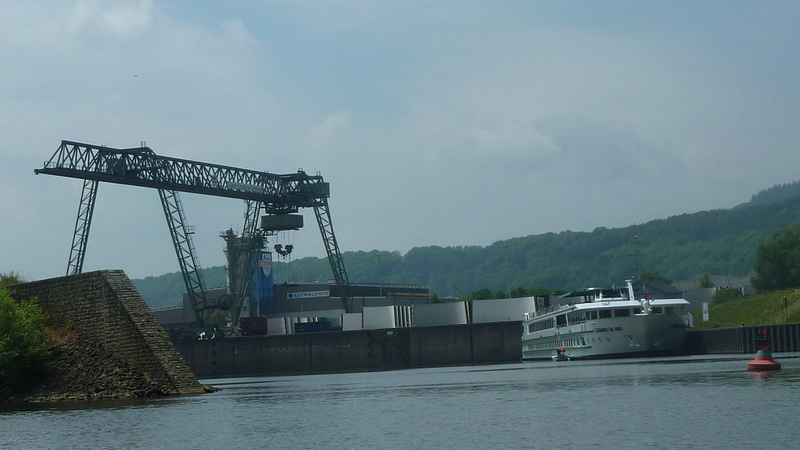 Main lock on the left bank with the small boat lock adjacent, then the dam and the power station on the right bank. 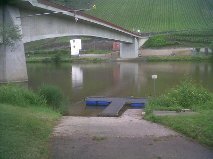 The canoe shoot between the large and small lock has been disabled. 7.5 metre drop. Power station 20MW capacity. 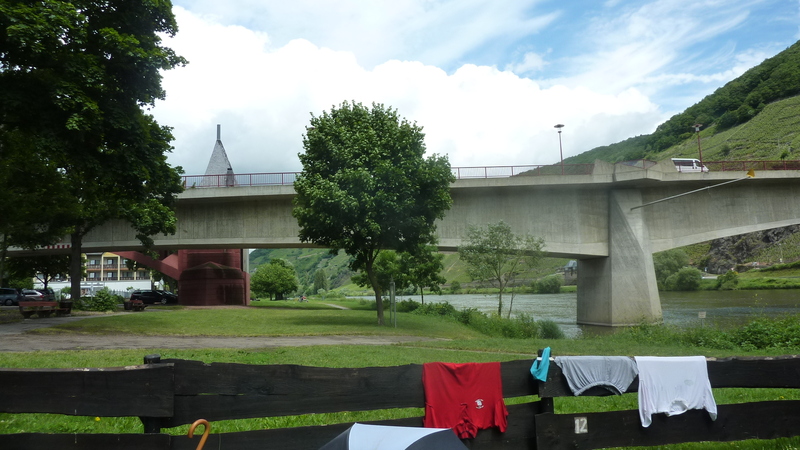 60 km – Kesten Left. 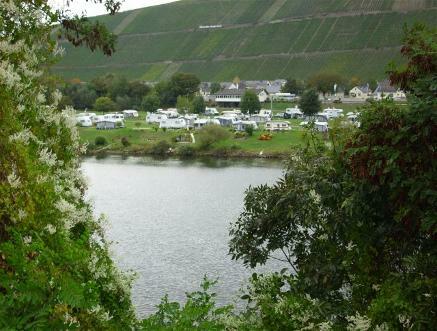 Camping Kesten is just an RV park. 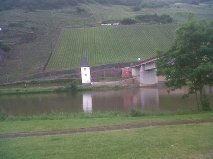 Paulinshofberg vineyard left. 61 km – Brauneberg right. Set a little back from the river but with easy landing at the ferry site. Picnic spots and paths up. 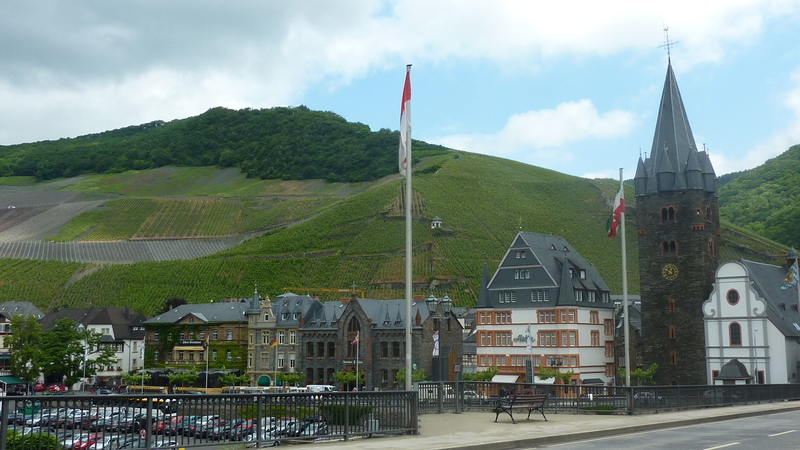 Another famous wine village. 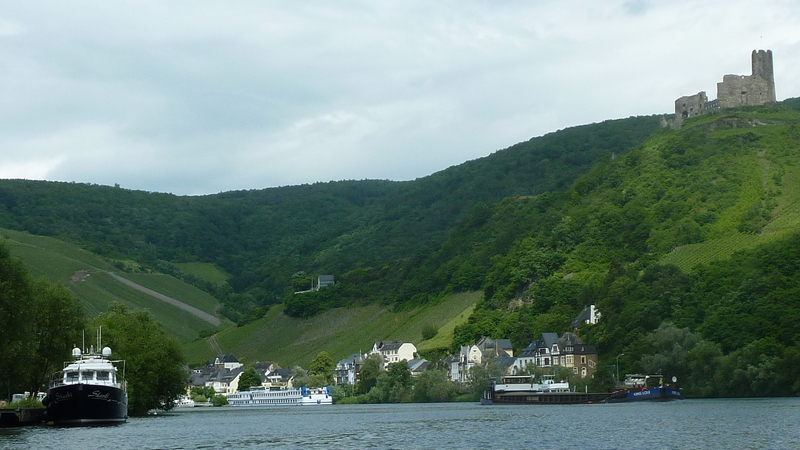 The long south facing hill left is the Juffer, and the lower central area opposite the village, the Juffer Sonnenhur, is said to be the very best. 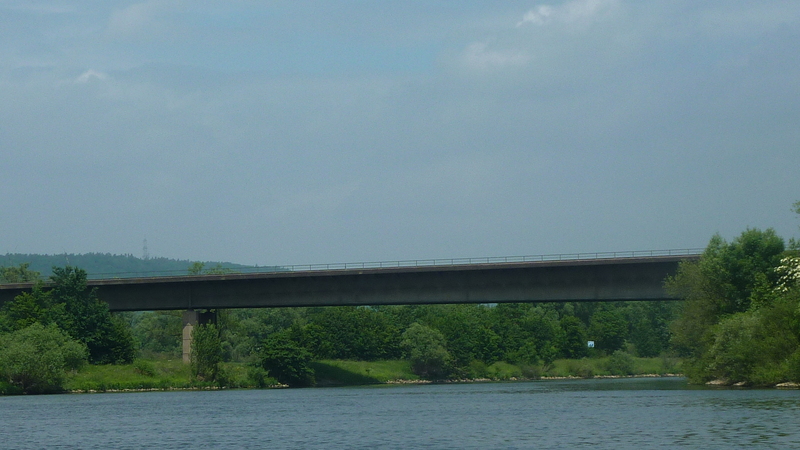 63 km – Mulheim bridge L158. 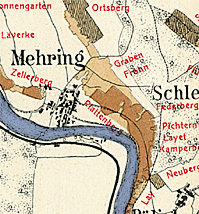 Mulheim right. 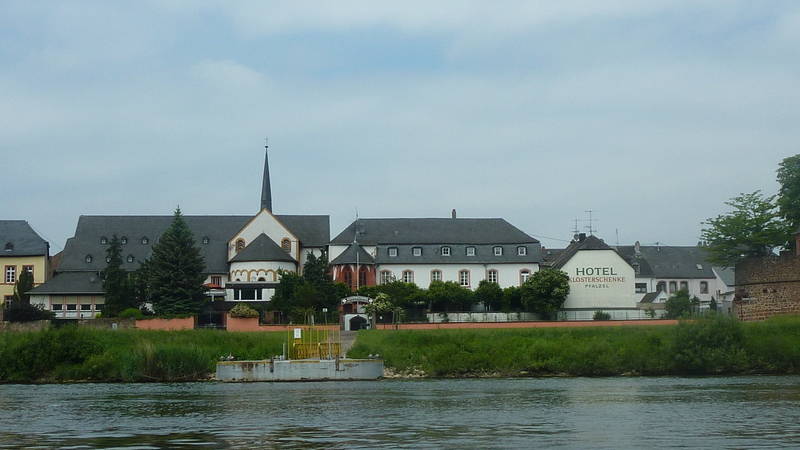 The Veldenzer Bach stream enters right just before the bridge, and the larger Lieser river left, 50 metres downstream. 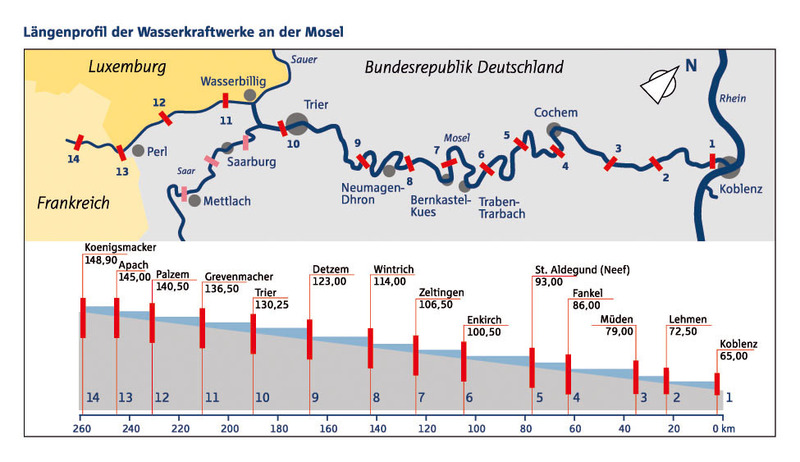 63.5 km – Lieser left. 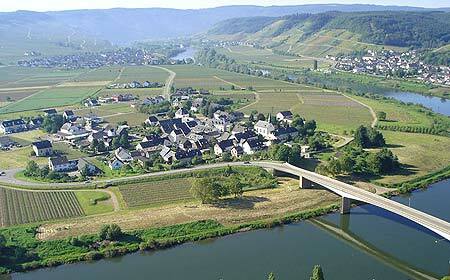 A beautiful village, but its wines are relatively unknown compared with Braunberg and Bernkastel either side. Best vineyard Neiderberg Helden. 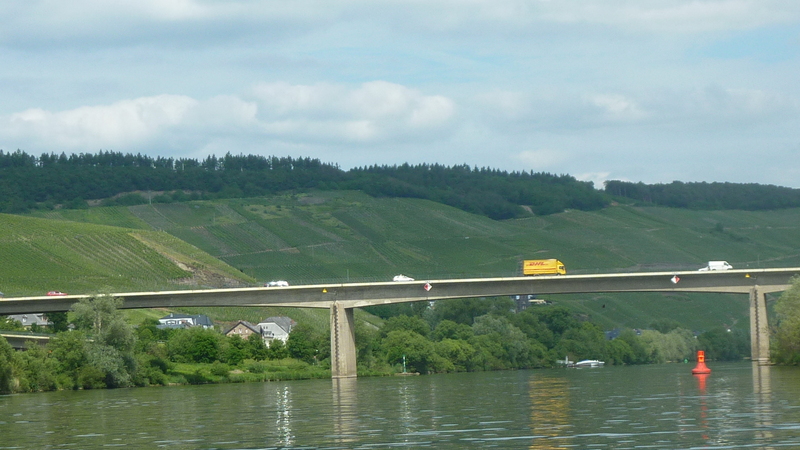 68 km – Bernkastel-Kues bridge. 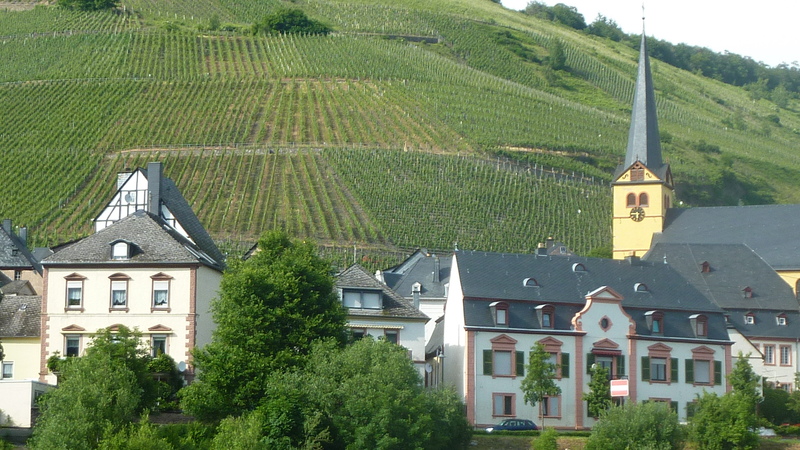 High on the right the castle and the Bernkasteler Doctor vineyard. 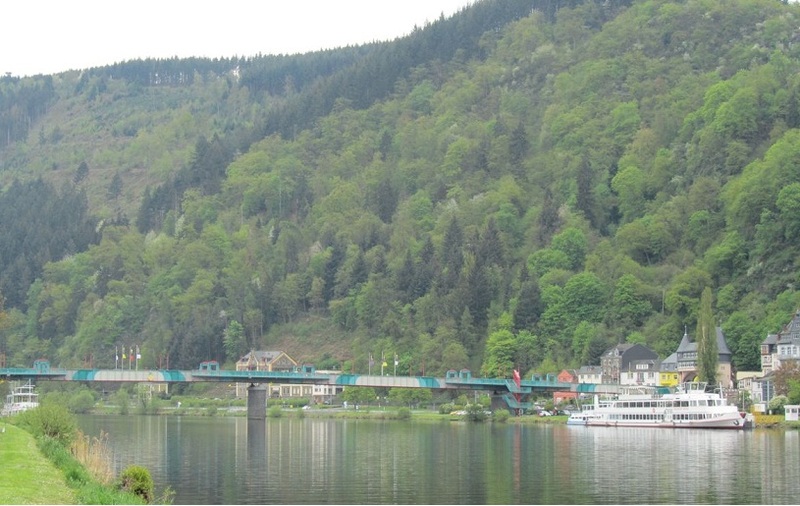 Tiefenbach stream enters right just after the bridge. 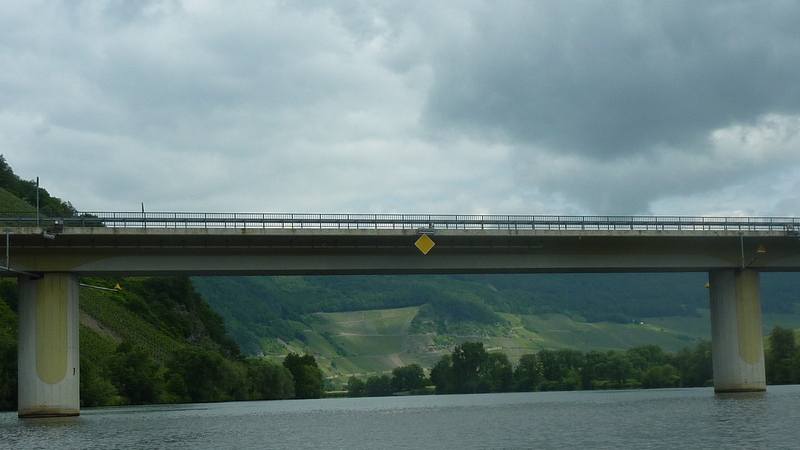 Paddle under the bridge and one of the great wine growing regions in the world comes into view. 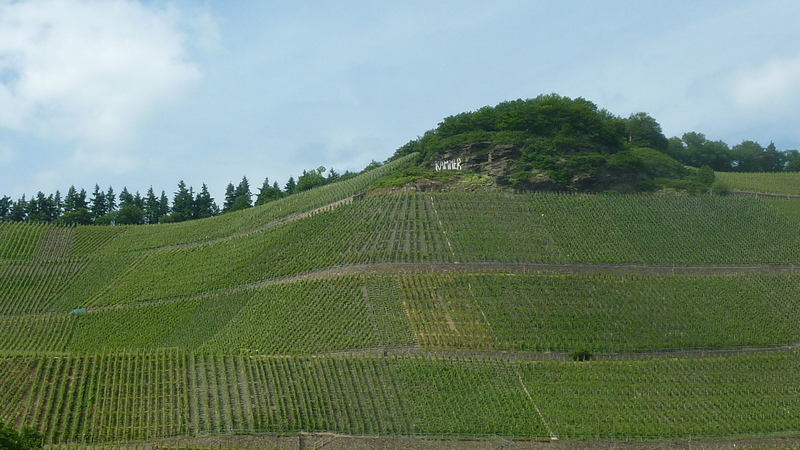 The five mile long ridge, from Bernkasteler Doctor at the south to Zeltinger Sonnenuhr (Sundial) at the north. 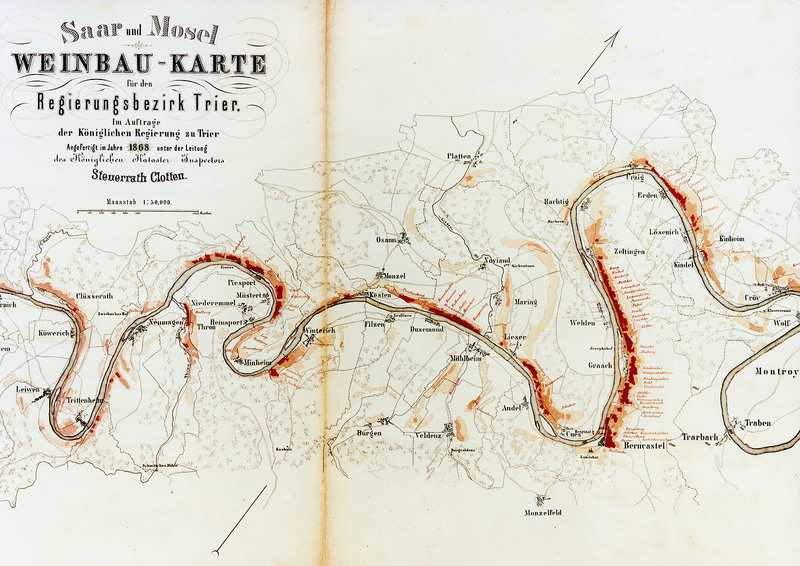 The 1868 vineyard classification map coloured the best vineyards dark – neither the slate, soil, nor orientation have changed. 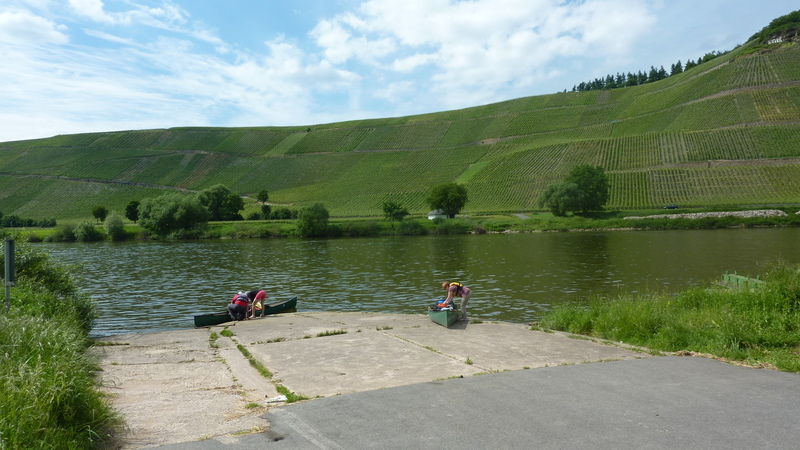 69.5 km – Graach an der Mosel right. 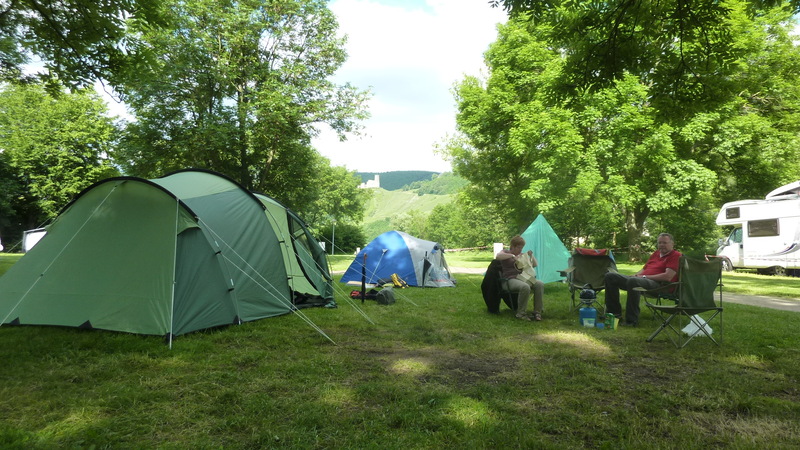 Camping Schenk left click here. 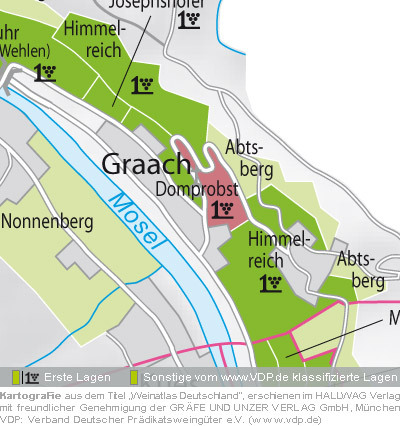 The finest Graach vineyards are Domprobst, Himmelreich and Josephshof. 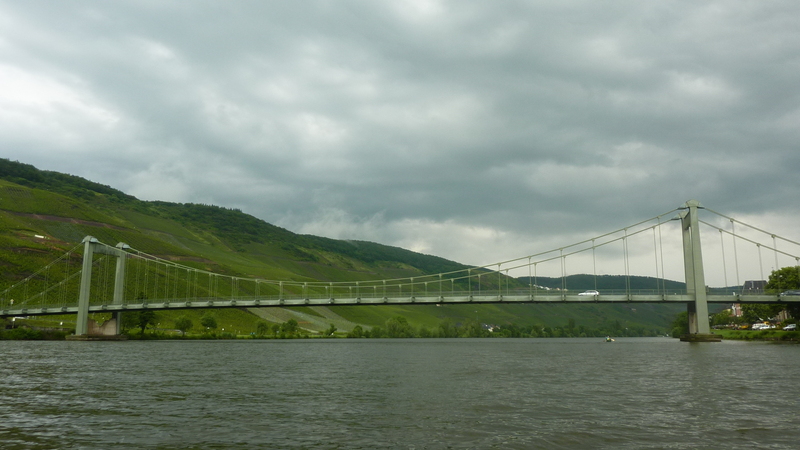 71 km – Wehlen suspension bridge. Wehlen left. 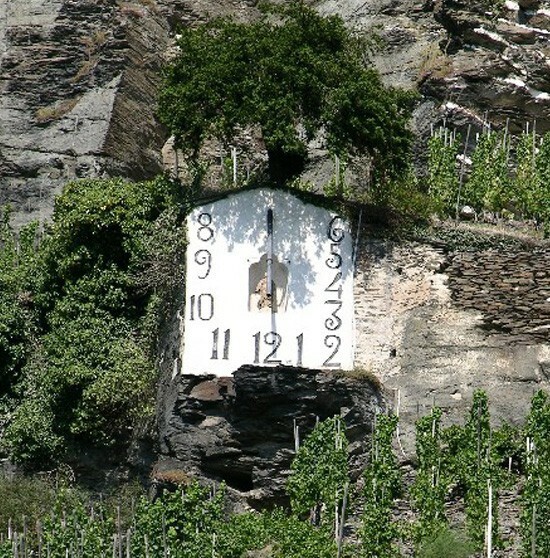 Finest vineyard Sonnenuhr (sundial) right. The locals are so proud of it that they’ve put up over 50 other sundials in the village. 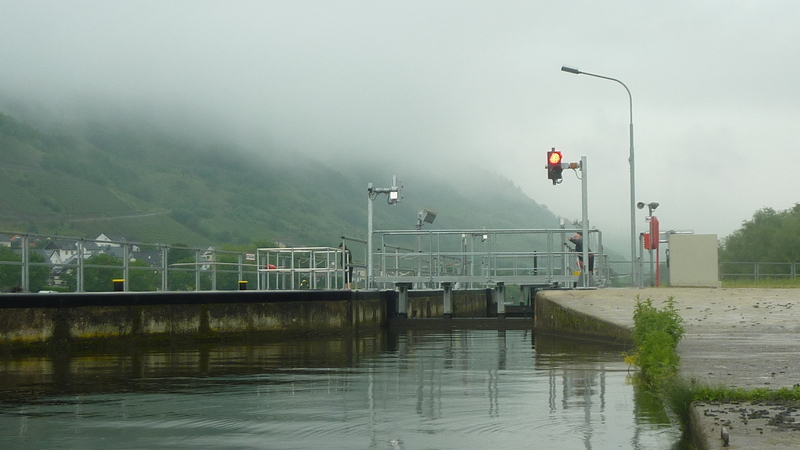 73 km – Zelting locks and dam. 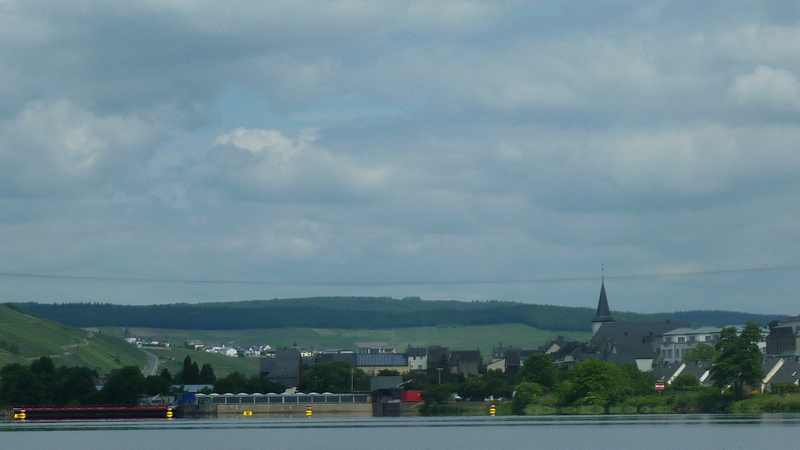 Two main locks to the left of the island. 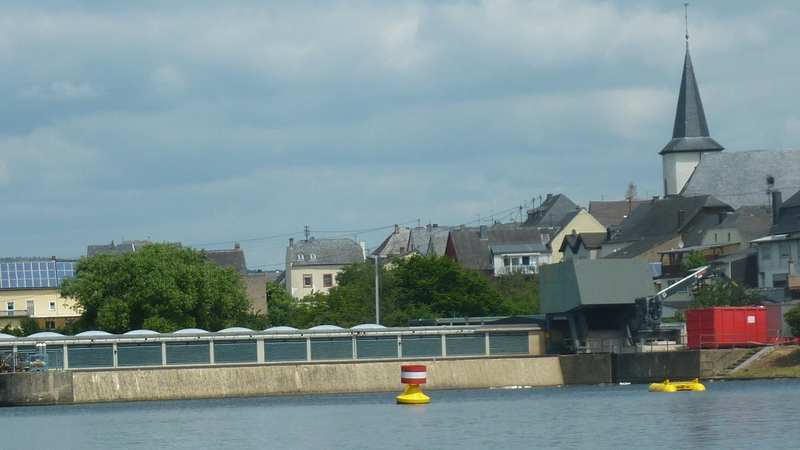 Small boat lock to the right, then the dam and the power station on the right bank. 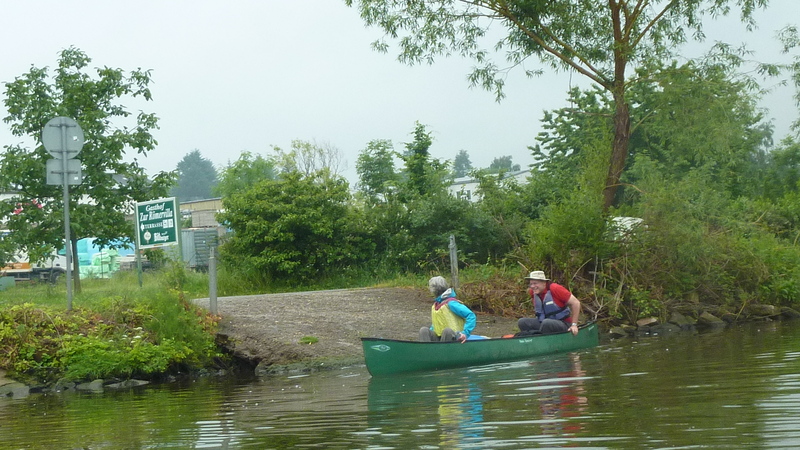 Pass to the right of the island to reach the canoe shoot just to the left of the small boat lock. Only a 6 metre drop. 13.6 MW capacity. 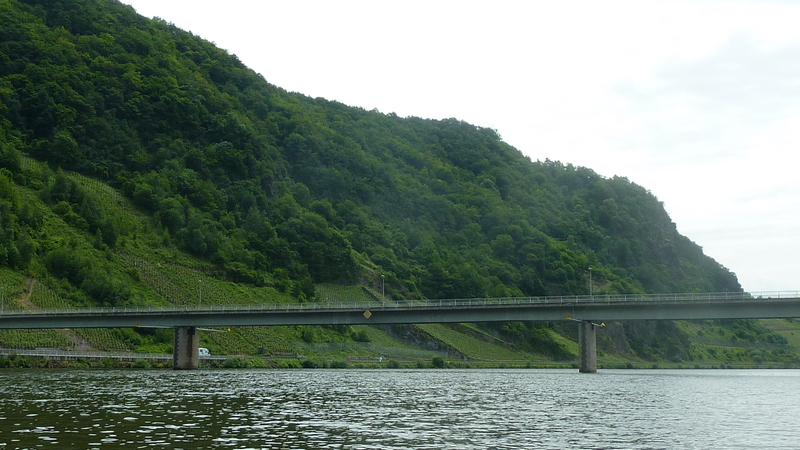 74 km – Road bridge. Zeltingen Rachtig right. 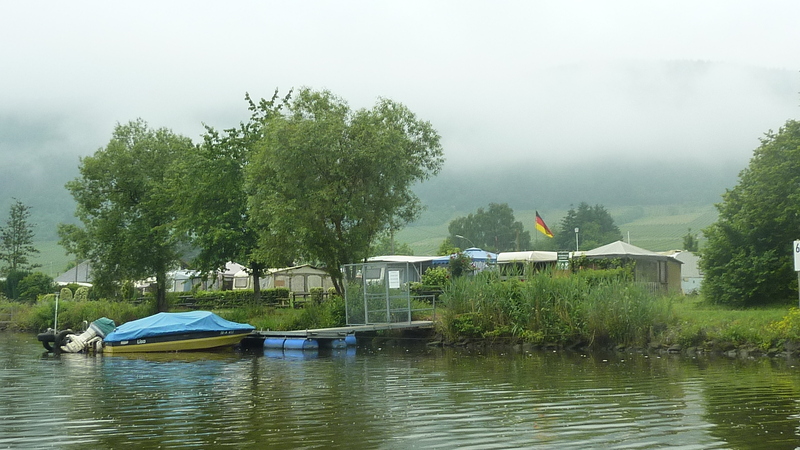 Camping Zeltingen-Rachtig. Adequate. Not a luxurious site. Land right immediately after the bridge on the rowing club landing stage. 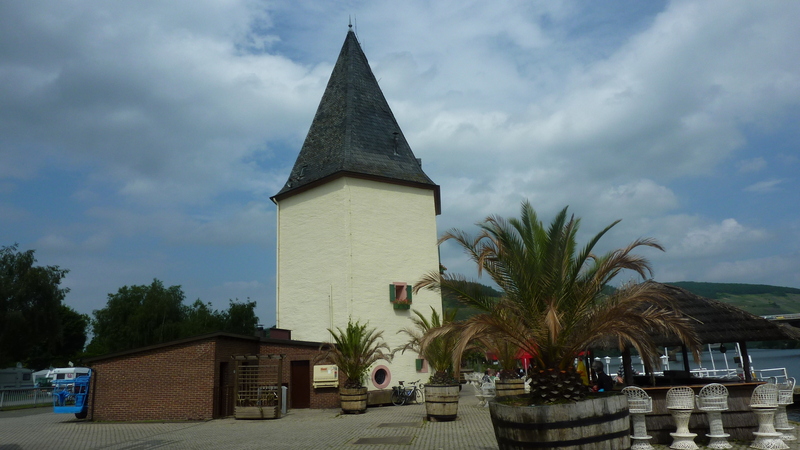 Beside the sundial, which it shares with Wehlen, the best vineyards are Himmelreich, Schloßberg and Deutschherrenberg, all on the right bank. 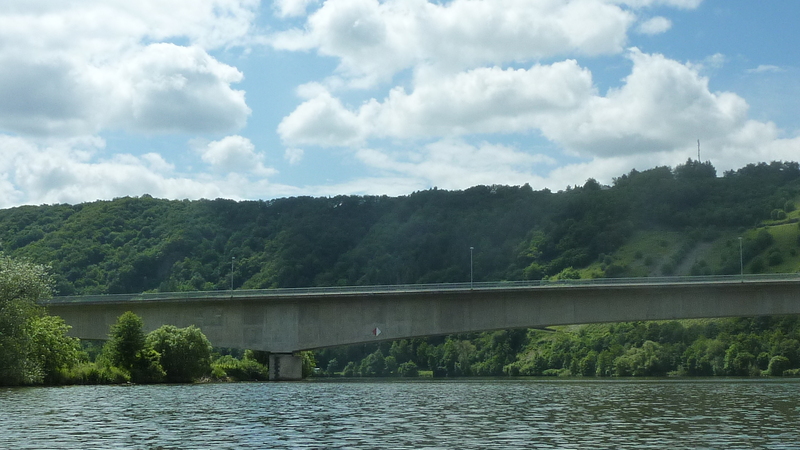 There is a proposal to build a huge bridge just downstream of Zeltingen to carry the B50 motorway over the river. Many people are campaigning against it (read more here). 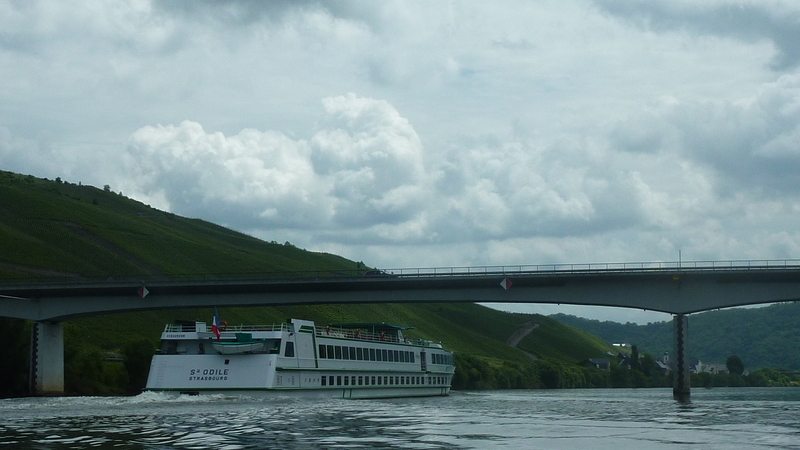 I’m relaxed about the direct environmental impact – people soon got used to similar bridges near Koblenz. 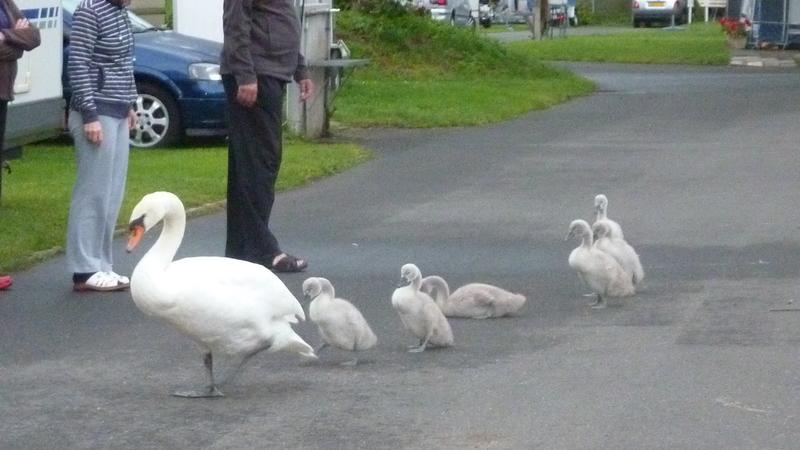 But who needs the road? Why is the government funding it and why is it not going to be tolled? 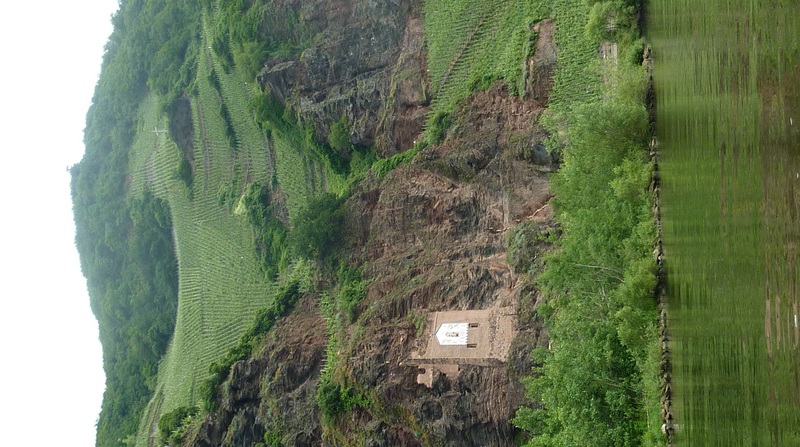 Some frighteningly steep vineyards. They risk their lives to make the really good stuff. 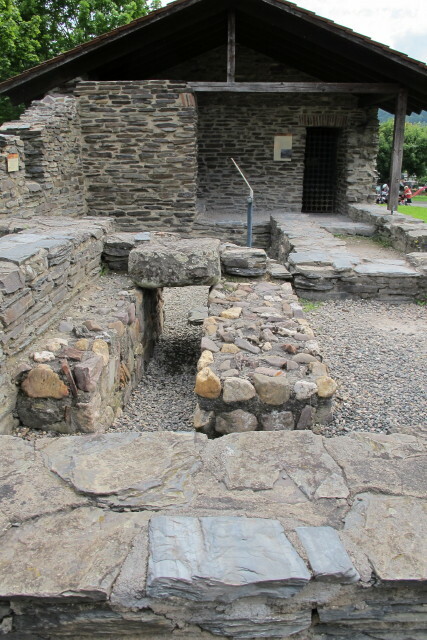 The reddish slate here is said to give the wine a spicy flavour. 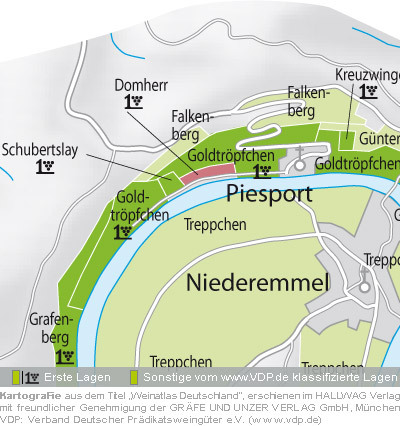 The best vineyard is Wurtzgarten (spice garden). 78.5 km Erden right. Camping. Click here. 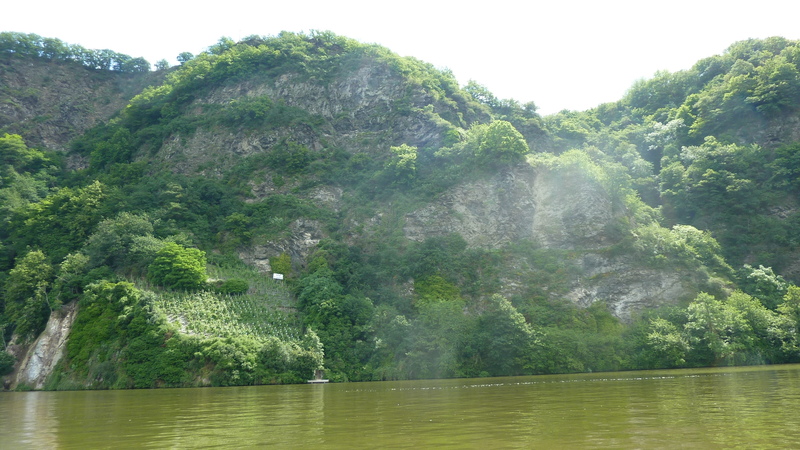 The best vineyards, on the left bank opposite the village, Pralat and Treppchen are tiny, among the steepest on the whole river and also lie on the same red slate as Urzig. 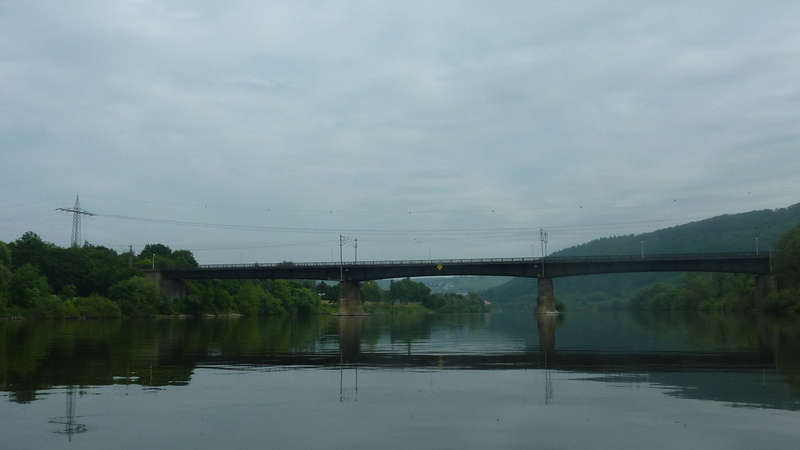 84 km – Krov left. Large tourist resort. 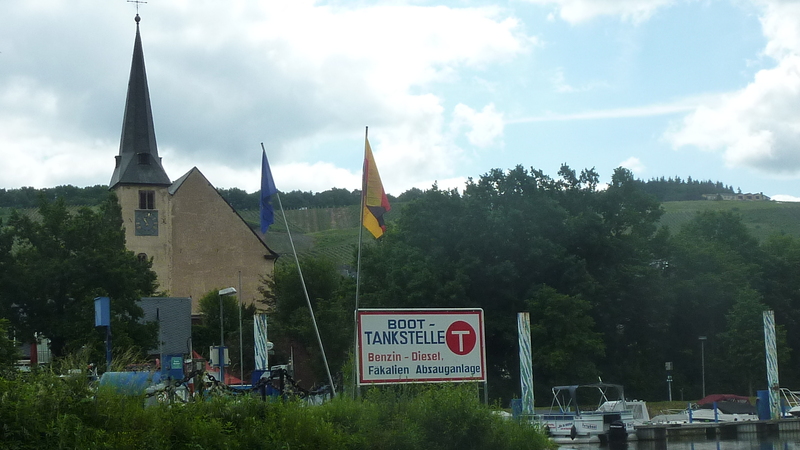 Not very scenic village. Picnic by the main road not great. 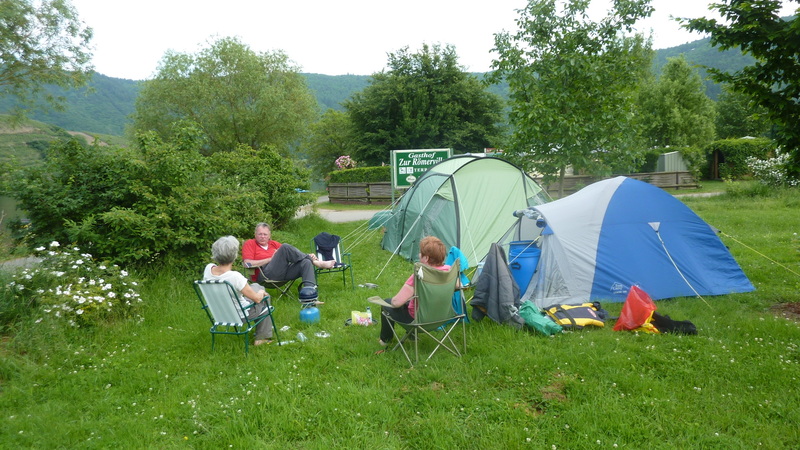 85.5 km – Camping right on the inside of the bend. Click here. Big site. 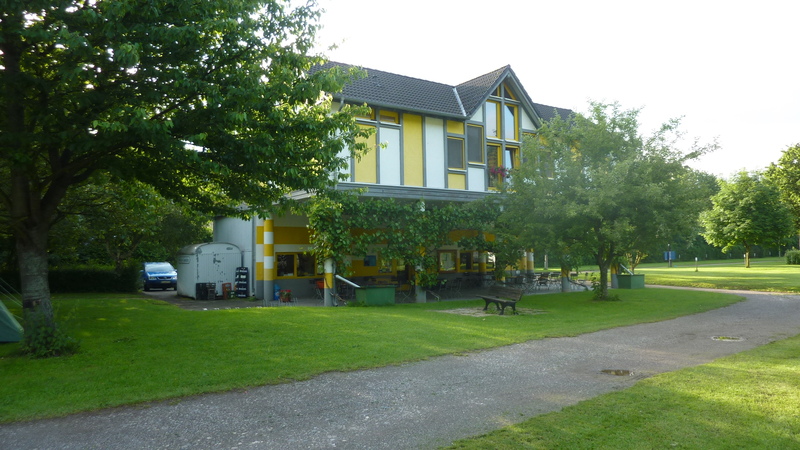 88 km – Camping Rissbach left (click here). 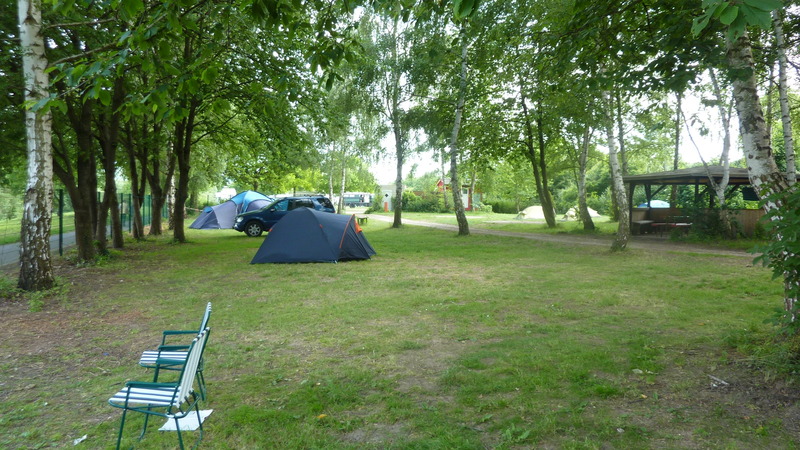 The last campsite before Traben Trabach. 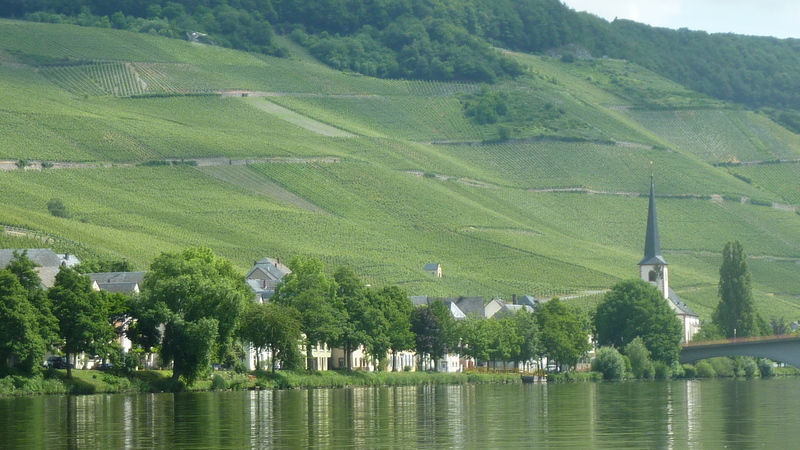 The fine Wurzgarten vineyard is just here on the same bank as the campsite. 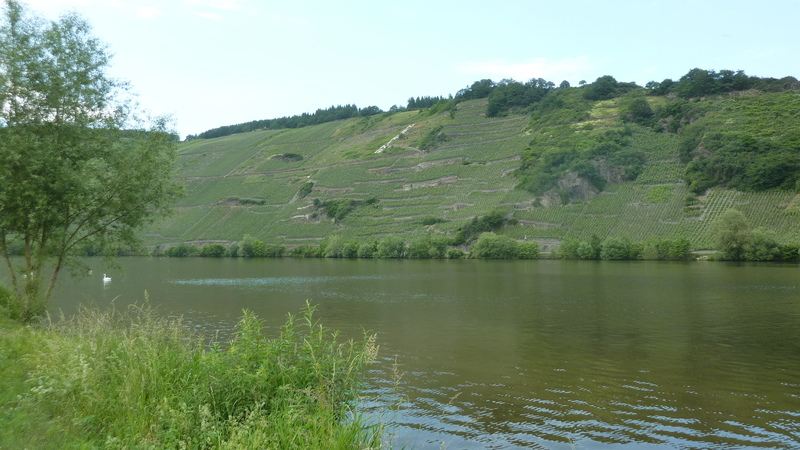 Ungsberg, the other great vineyard in Traben Trarbach is up this side valley. 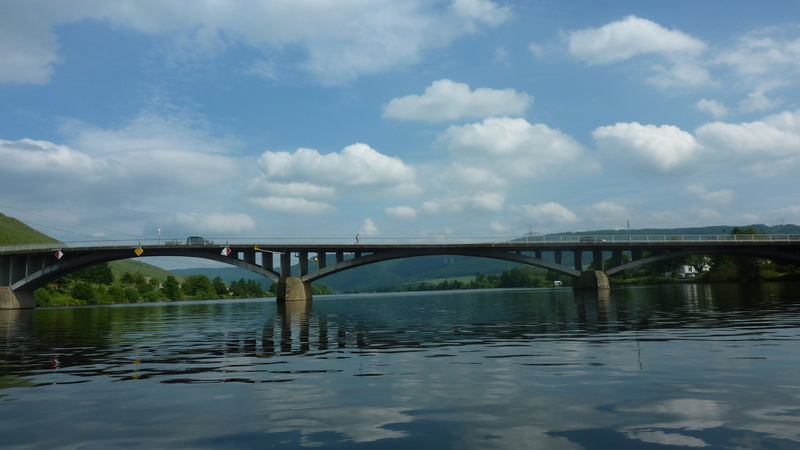 90 km – Traben Trabach bridge. Unusual in that it looks better from the road than the river.